ARP – Air Raid Precautions – had begun life in 1924 as a Home Office subcommittee under the chairmanship of Sir John Anderson. It sprang from the British civilian experience of bombing in the First World War, during which Germany had mounted 103 raids (fifty-one by airships), mostly on London. A total of 300 tons of bombs had killed 1413 people. The worst single bombing incident of the war occurred in London on 28 January 1918 when a 660 lb. bomb hit the Odhams print works in Long Acre, killing thirty-eight and injuring eighty-five. In March 1935 Hitler proclaimed the existence of a new German air force, the Luftwaffe, boasting that it was already equal in size to the RAF. It was subsequently combat-tested during the Spanish Civil War, in which the destruction of the Basque town of Guernica by the bombers of the German Condor Legion provided a chilling image of the horrors of modern warfare. In the late 1930s British air planners anticipated that, if war came, the Luftwaffe might launch an overwhelming air attack on London. Twelve autonomous Civil Defence regions were established, with London counting as a single region. In the Blitz the warden was to be the eyes and ears of the local Civil Defence Control Centre, patrolling the streets and controlling ‘incidents’, the bureaucratic euphemism invented to describe every sort of disaster inflicted on the civilian population by an air raid. It was the warden’s report of an ‘incident’ that set the civil defence machine in motion, summoning stretcher parties, fire engines, heavy rescue units and mobile canteens – all the services required to care for the injured, comfort the survivors and dispose of the dead. A corps of ARP volunteers was established throughout Britain starting in 1938, comprising Air Raid Wardens, Observers (plane spotters), Fire Watchers, Rescue Workers, Messengers, etc. A small percentage of the Air Raid Wardens were full-time and received a small wage. After completion of training, ARP volunteers were issued a hallmarked sterling silver badge (after 1940 they were made in a white metal). The most visible ARP volunteers were the Air Raid Wardens who were invested with the authority to enforce blackout regulations, determine Air Raid alert status and establish shelter assignments. They also assisted the regular Police force if required. 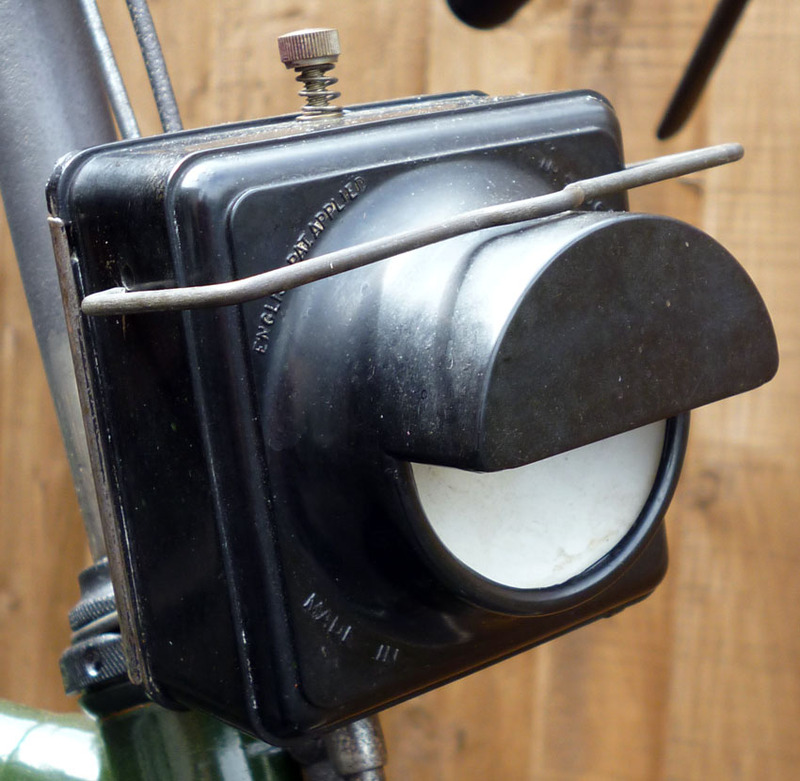 An ARP Bicycle Messenger had to ride his bike to the local ARP Warden’s post after an air raid ‘all-clear’ siren had sounded, in order to deliver messages to other posts and Civil Defence control as directed by the Wardens. That could be tricky – the all-clear siren was sometimes presumptuous – and Bicycle Messengers were sometimes killed in air-raids. Traffic accidents were also frequent at first, as vehicles and pedestrians had to get used to a complete lack of lighting in streets, buildings and on vehicles. I bought this 1925 Raleigh from Neil, a collector. He had purchased it from the grandson of an Air Raid Warden who’d bought it at auction in 1938 to serve him in his wartime duties in Sheffield, as Senior Air Raid Warden. At that time, volunteers were being mobilised around the country to prepare for War and German bombing raids. Sheffield was a major British industrial centre and the ARP in that city was important. It was used regularly until the end of 1940 when the bombing of Sheffield made the use of bicycles too dangerous. (See further down the page about the ‘Sheffield Blitz’ of December 1940). The bike’s owner sustained serious injury during a bombing raid. He retired from active ARP duty, and his bicycle was stored in his shop storeroom for later use. But it actually remained there in storage for over thirty years, until the shop was sold in the 1970s, and the bike was passed to his grandson. 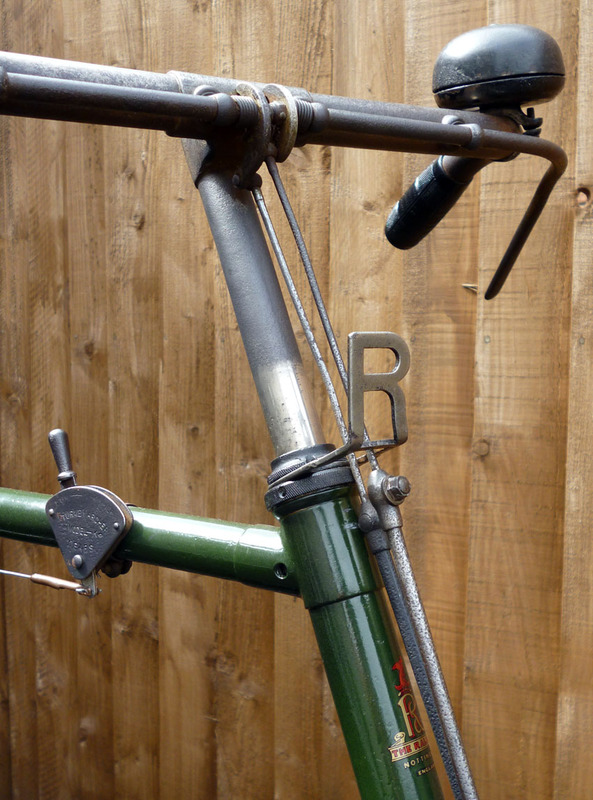 Neil purchased the bike from the grandson in 2005, restored the paintwork on the frame and chaincase, replaced the handlebar grips with period Dover celluloid grips, fitted new tyres and gave it a thorough mechanical overhaul. The original nickel plated handlebars are a bit faded with age. Neil has used it for displays around the north of England over the past eight years, where it has won prizes. 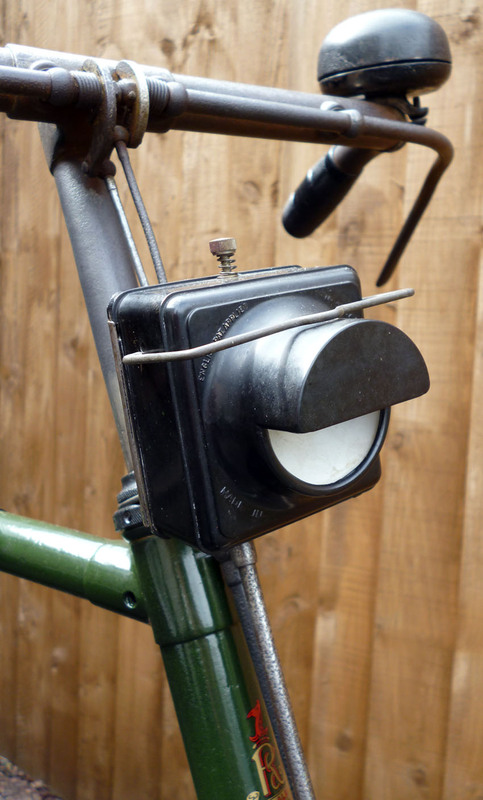 It is fully accessorised, with bell, pump, rear carrier and luggage box, and a particularly attractive wartime bakelite black-out front lamp. Inside the rear luggage box is a magazine called ‘All-Clear’ which was the magazine for Air Raid Wardens in Sheffield; the cover has disintegrated, but the rest of the magazine is intact. One of the original silver ARP badges is also included with the bicycle (below), as well as an A.R.P Warden’s Hudson & Co whistle, and an album with a complete set of Wills AIR RAID PRECAUTIONS cigarette cards (illustrated at the bottom of the page). Above, you can see one of the pages from the ‘All Clear’ magazine. The ‘Sheffield Blitz’ occurred during the nights of 12 December and 15 December 1940. On the afternoon of 12 December British monitoring stations detected X Verfahren radio beams being laid across northern England and calculated that the likely target of the coming raid would be Sheffield. The yellow alert was received at 6.15pm followed by the purple alert at 6.45pm. The red alert was sounded at 7pm. The attack was made by three main groups of aircraft flying from airfields in northern France. 13 Heinkel 111s from Kampfgruppe 100 – the German Pathfinder unit – arrived over the city at 7.41 p.m. and dropped 16 SC50 high explosive bombs, 1,009 B1 E1 ZA incendiaries and 10,080 B1 E1 incendiaries. The first main group was made up of three waves of 36 Junkers 88s and 29 Heinkel 111s. The second group was made up of 23 Junkers 88s, 74 Heinkel 111s and 7 Dornier 17s. The last group was made up of 63 Junkers 88s and 35 Heinkel 111s, a total of 280 aircraft. At about 9.30 p.m. a stick of bombs fell on Campo Lane and Vicar Lane, demolishing the West end of Sheffield Cathedral. At about 10.50 p.m. a 500 kg bomb fell on and destroyed the C&A building opposite the Marples Hotel. At 11.44 p.m., The Marples Hotel itself received a direct hit. It is not known exactly how many people were killed but approximately 70 bodies were recovered from the rubble. This was the single biggest loss of life in the attacks. [ The majority of the bombs on this night fell on the City Centre or on residential districts with the last bombs falling at 4am. The second night of the Blitz saw the first use of a new German policy for their pathfinders. High explosive bombs were no longer carried and were replaced by incendiaries. On this night the pathfinder force was made up of 16 Heinkel 111s that dropped 11,520 B1 E1 incendiaries between 7 p.m. and 7.50 p.m. The 15 large and numerous small fires started were visible from 150 km away. The main raid was carried out by 50 Heinkel 111s and 11 Dornier 17s. The raid finished at 10.15 p.m.. Many steelworks received hits, including Hadfields, Brown Bayleys and Steel, Peech & Tozer Ltd, although the damage was not serious enough to affect production. In total over 660 people were killed, 1,500 injured and 40,000 made homeless. 3,000 homes were demolished with a further 3,000 badly damaged. A total of 78,000 homes received damage. Six George Medals were awarded to citizens of Sheffield for their bravery during the raids. Below, a postcard reproduces a front cover of The Morris Owner magazine, illustrating a Morris Eight approaching a sandbagged ARP post. Despite appalling casualties, the traditional British sense of humour played a large part in helping us win the war. Air Raid Wardens, like everything else during WW2, were fair game for humour. This series of A.R.P. cigarette cards shows in clear pictures some of the things that the Government and the Local Authorities are working out for the protection of the general public, and also some of the things that each member of the public can do for himself in time of emergency. As Home Secretary I am responsible for a Home Defence Service which might affect the life of any person in the country, and I therefore welcome these cigarette cards for the manner in which they bring home to the householder and his family what they can do for themselves. Air Raid Precautions are not mysterious. They are based on commonsense suggestions and the essential things recommended cost very little and demand ingenuity and improvisation rather than expenditure. Even some of the more elaborate recommendations can be carried out quite easily in co-operation with a neighbour. I commend a study of these cards to your attention.